Note: : If you wish, please skip directly to the slideshow of Damnoen Saduak at the bottom of the page. 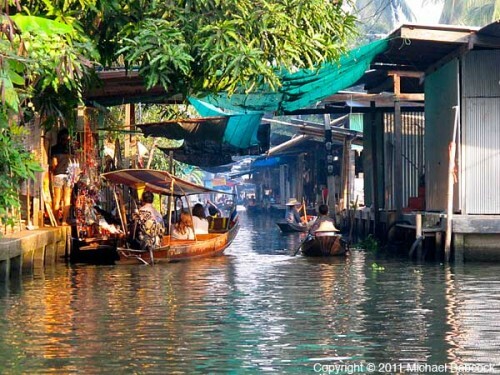 Kasma does take her “off-the-beaten-track” tours to this popular destination. 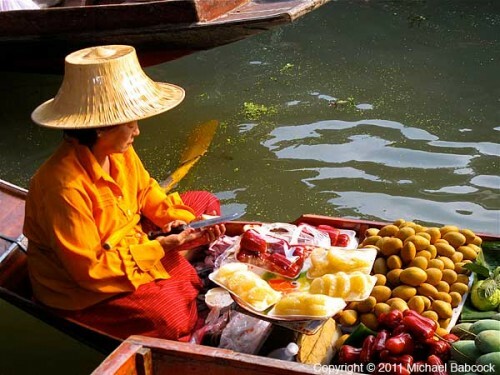 In the past, particularly in Bangkok (once called “The Venice of the East”), floating markets were more common than markets on land; this is a chance to see floating markets and imagine how it must have been. 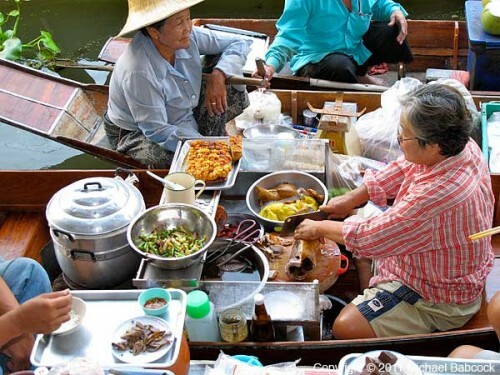 In order to get the best experience, Kasma leaves Bangkok quite early in the morning so that the group can arrive by 7:00 a.m. At that time, there are few tourists and are still many vendors in their boats on the klong (canal). 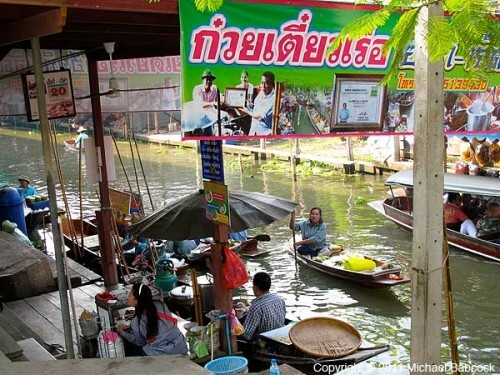 It’s a chance to see the market before it’s overrun by tourists. 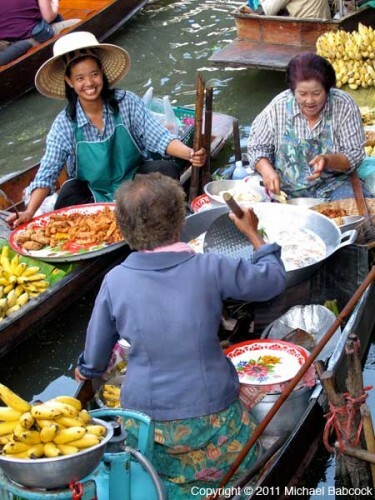 Kasma rents boats and, after grazing through the market and purchasing a few kanom (snacks) to tide the group over until breakfast, she takes the group through some of the auxiliary canals near the market. 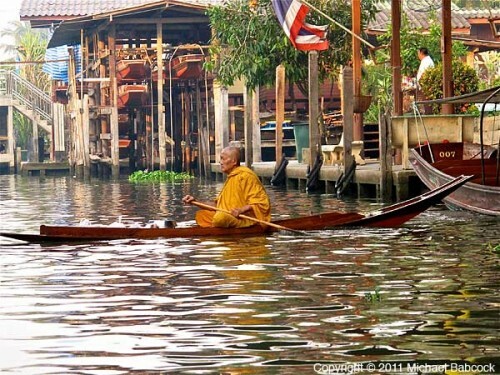 One thing you can not avoid on the boat rides is slowing down near the stalls on the side selling clothes and souvenirs. Be warned: the prices at the market are mostly exorbitant, two to three times (or more) what an item sells for elsewhere. So if you see something you like: bargain!! 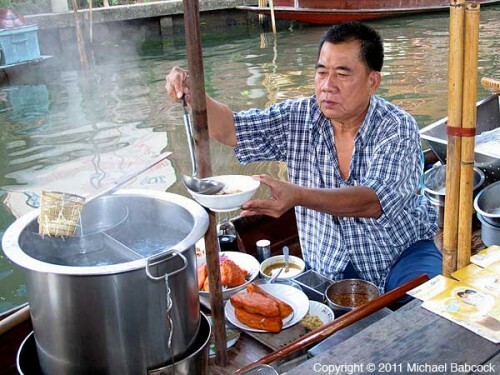 After a stop to see palm sugar being made (if the group is lucky: they’re not always working when we are there), the boats return to the main market area where the tour members sit and eat delicious “Boat Noodles” (ก๋วยเตี๋ยวเรือ – Kway Teow Reua) – see our blog Boat Noodles at Damnoen Saduak Market. 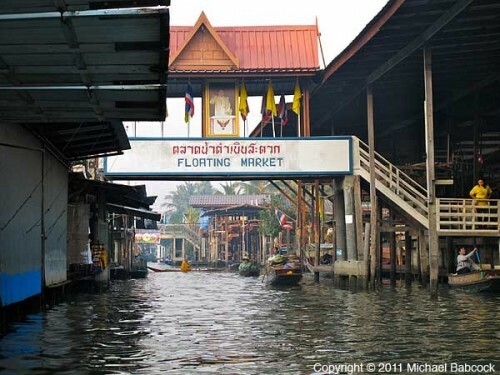 Afterwards, we walk the market area by the piers, grazing and shopping for fruit, and climb the stairs to a bridge overlooking the main canal, a good vantage point for photographs. 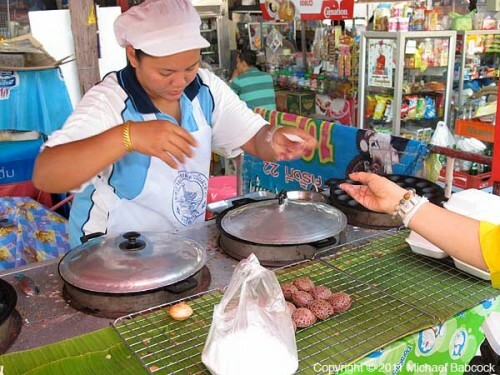 We also make a stop at a stand on the way out of the market to buy ขนมครก (Kanom Krok) -Grilled Coconut-Rice Hot Cakes. 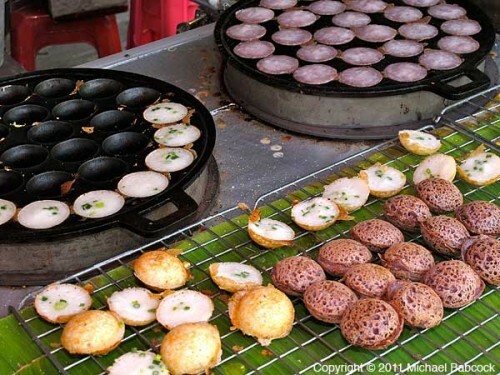 Sometimes they make them using black sticky rice flour so we can purchase them in two colors. It’s a fun excursion. Well worth the visit, particularly if you can get there early. 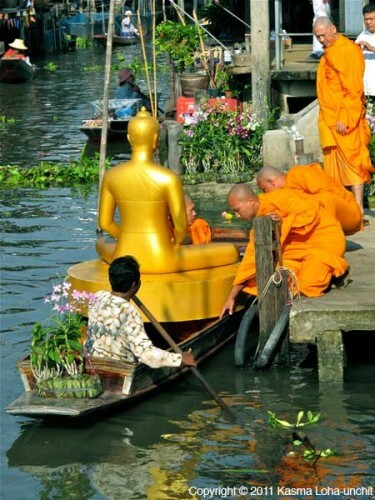 By Car: From Bangkok. Take Highway No. 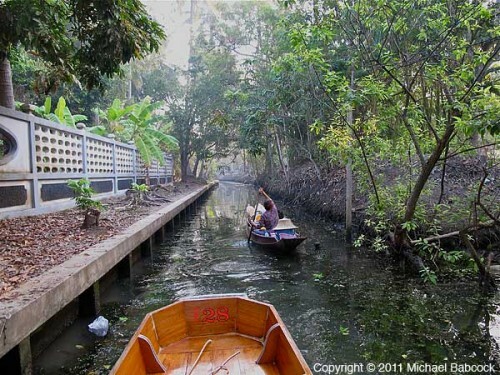 4 (Phetchakasem Rd.) and turn left at Km. 80. 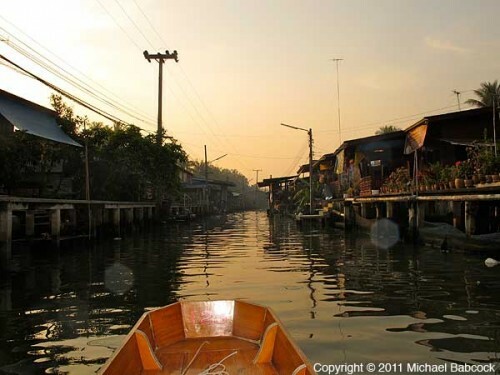 You’ll travel about 25 kms more along the Bangpae-Damnoen Saduak Rd. You can also get there by joining a tour or by bus from the Southern Bus Terminal on Borommarat Chachonnani Road starting at 6 a.m. Written by Michael Babcock, January 2013. 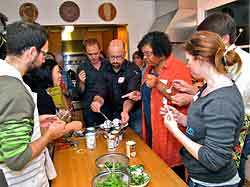 The coconut milk-tasting exercise is an eye- and palate-opening experience for my cooking students on the very first session of their four-week beginning Thai cooking class. They are given 8 to 10 different brands of coconut milk to taste, ranging from excellent to mediocre to awful and unfit for consumption. Half or more of the cans end up being thrown out. 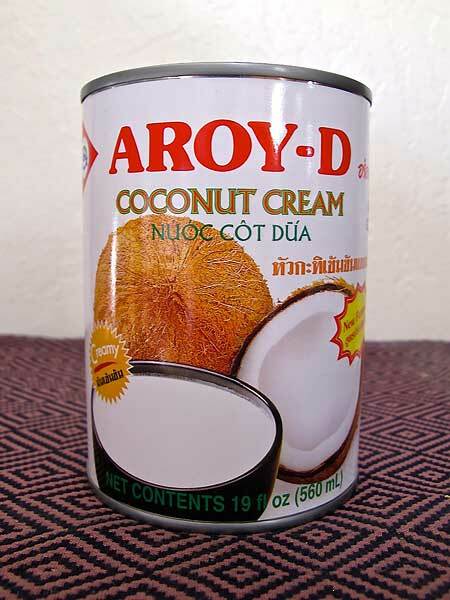 The point is made and the lesson learned: not all coconut milk is the same, so don’t just go out and buy any brand if you wish to make a delicious Thai curry or dessert. 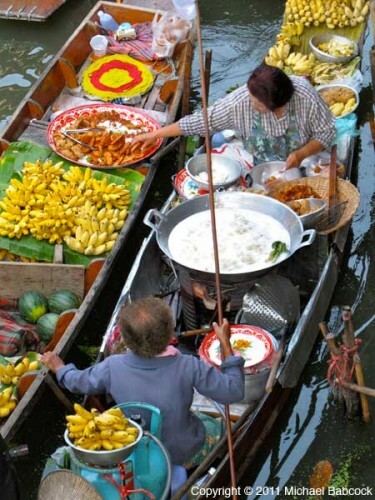 This valuable learning tool has become expensive with the price of coconut milk doubled and tripled what it was a couple of years ago due to the acute coconut shortage in Thailand – the world’s major producer and exporter of canned coconut milk. And it’s unlikely that the price will return to former levels any time soon (see our last blog about the coconut shortage). For someone who hates waste, it’s painful for me to see $10 to $15 gurgling down the drain. 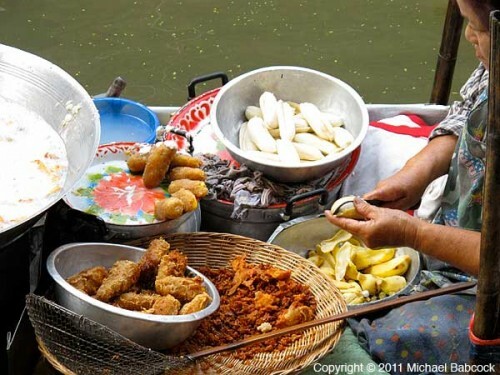 But it’s definitely well worth it for my students to learn to distinguish subtle differences through their sense of taste and come to know that choosing the best ingredients is an important starting point to becoming a good cook. Along with the price hike, the quality has changed in some of the brands of coconut milk and not necessarily for the better. In order to meet rising demand with a reduced and limited supply of coconuts, companies have developed new ways to make more coconut milk out of fewer coconuts. That, of course, affects quality. 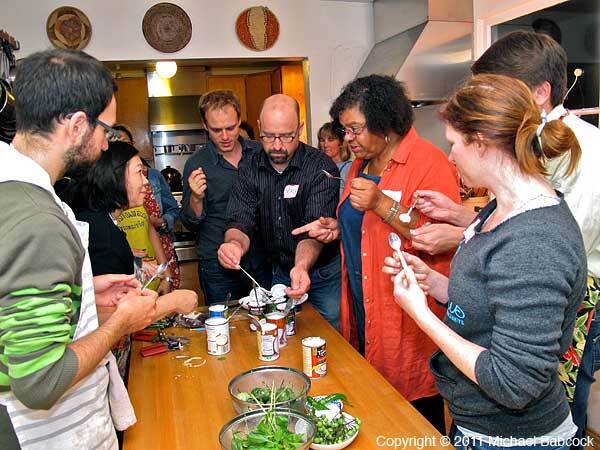 Canned coconut milk has become lighter and it’s now difficult to find cans with enough cream for some of those dishes that require rich coconut cream. My students find out from their tasting exercise that cans labelled as “coconut cream” are not necessarily creamier or richer than those labelled simply as “coconut milk.” In the past, I’ve depended on Chaokoh and Mae Ploy brands to supply me with the rich cream I needed for dishes such as haw moek (curried fish mousse), choo chee curry and rich desserts like coconut custards. 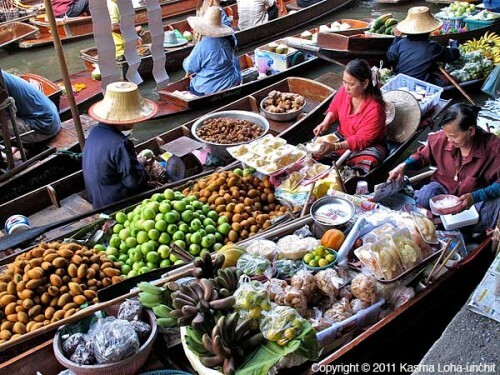 These two brands are widely available in Southeast Asian markets in the Bay Area and usually come up top in tasting exercises. 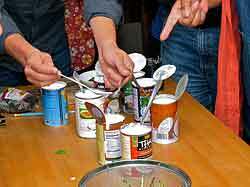 Each can of the same brand can have varying amounts of cream if it does not contain an emulsifier. I rely on shaking the can to determine how much cream it contains. If it sloshes like water, there’s no question that it is light; if it gurgles like a thick fluid, then it’s likely to be fairly rich; and if shaking hard produces no sound whatsoever and room temperature is cooler than 78 degrees in the store, then the can is likely to contain almost all cream. 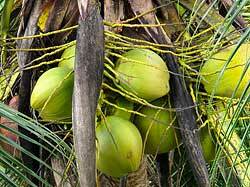 The coconut oil found in coconut cream firms up when the weather is cool; its melting point is 78 degrees. The shake test is how I collect my cans of thick cream for those Thai dishes that require them – and not by buying brands that say “coconut cream” on the label. 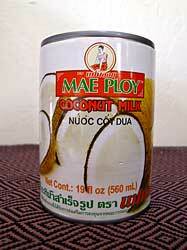 Mae Ploy brand still has good cream content and the cans that pass the shake test can be relied on for those rich coconut-based dishes. 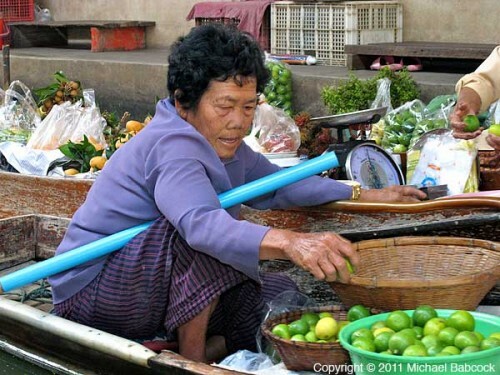 Avoid buying “light coconut milk” since you’ll be paying mostly for water. 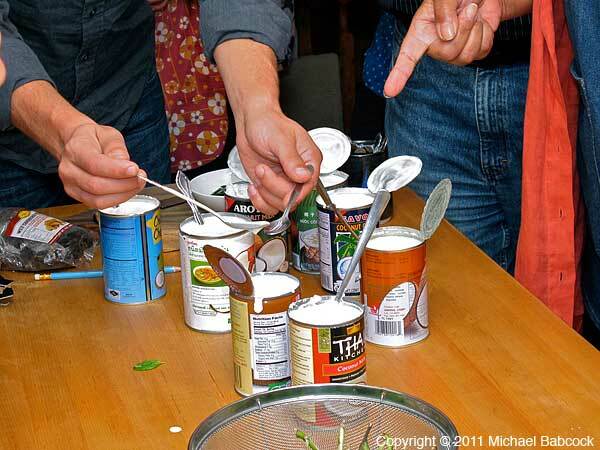 The flavor is in the cream, so choose cans that contain rich milk and then you can thin it with water any way you wish if you want your curry or soup to be lighter. But don’t be afraid of the oil in coconut milk; it’s one of the best fats for you and can actually help you lose weight as it has the ability to increase metabolism and burn off fat from other sources in your meal. (See The Truth About Coconut Oil on our website). Last year at the height of the coconut shortage when prices rose dramatically, I started noticing that Chaokoh had become lighter and, instead of having a thicker and sometimes coagulated cream on top and watery liquid on the bottom of the can, it appeared more emulsified. When heated, instead of melting down to a smooth, lighter fluid, it thickened up as if it contained starch. 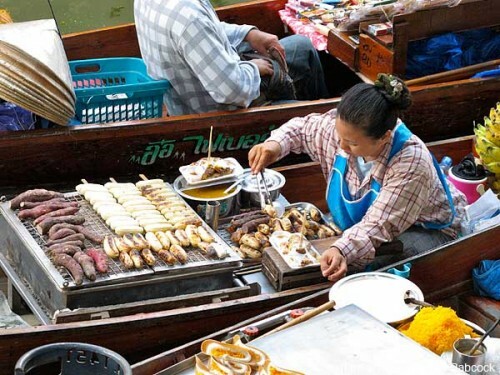 At the same time, it had become almost impossible to separate the oil from the cream in the first step of making a curry – frying the curry paste in coconut cream. This was frustrating for some of my students who emailed to ask what’s wrong with the Chaokoh coconut milk they’re buying. I also noticed that when making peanut sauce in class, the sauce unusually thickened more than I wanted it to. Suspecting that starch had been added to the product without stating so on the label, Michael emailed the company to ask if they indeed had done so. Initially, we didn’t receive a reply. Michael emailed them an additional two times – again without any response. Finally, in frustration, he emailed them to say that we had recommended their product to thousands of our students over the years and if we didn’t hear from them, we could “un-recommend” their brand. That mild threat generated a prompt response. Although they deny having added starch, they admit that their product now contains more carbohydrates than before. 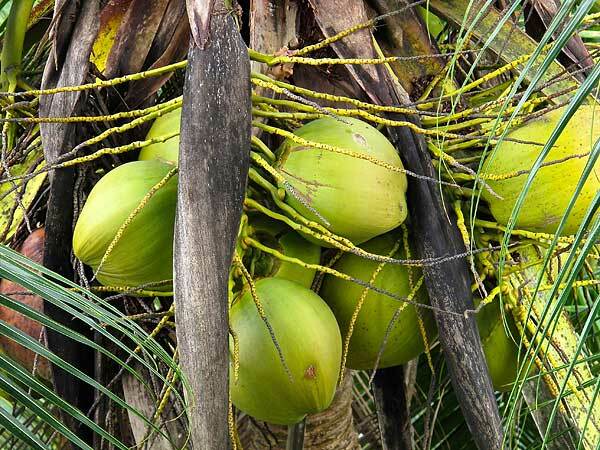 From our understanding of their reply, it seems that they have found a way to grind and reduce the pulp completely so that more of it is incorporated into the coconut milk. Because there is more pulp (i.e., carbohydrates), when the creamier-looking stuff on the top of the can is heated, there is little fat to be separated and that’s why you can’t see oil floating on top as you used to for frying your curry paste. At the same time, the milk thickens with the pulp acting like starch. Their reply also explains why their product looks more emulsified and why you won’t see thick coagulated cream as in the past on cold days or when the cans are refrigerated to make it easier to separate the cream in making dishes like haw moek. 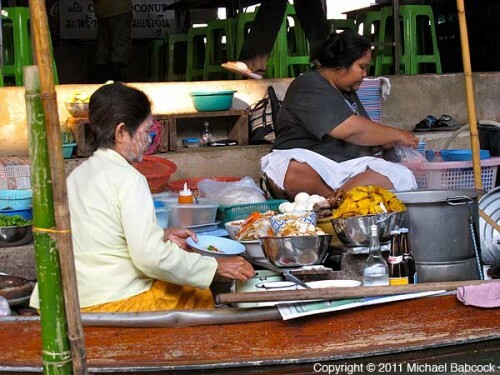 Thais do like to see a thin layer of oil floating on the top of their curries. 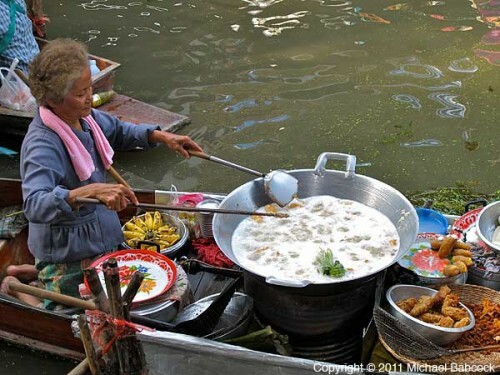 It gives color to the dish instead of the pale whitish color of opaque coconut milk. Nowadays, to accomplish this and to help fry the curry paste to a tastier result, I recommend my students to buy and use pure coconut oil to fry curry pastes when they are making curries. Using other oils will add an oiler and often incompatible taste. 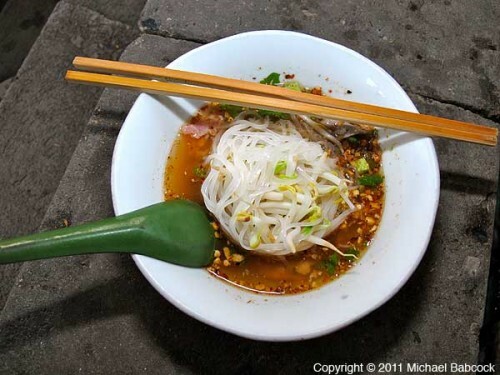 Although Chaokoh is now more or less low-fat, it still has good flavor. A good test of its superior flavor is when we used it to make coconut sorbet. It’s still creamy and has delicious coconut flavor. It does, however, contain a preservative. For people who wish to stay away from preservatives, a readily available Thai brand is Aroy-D. 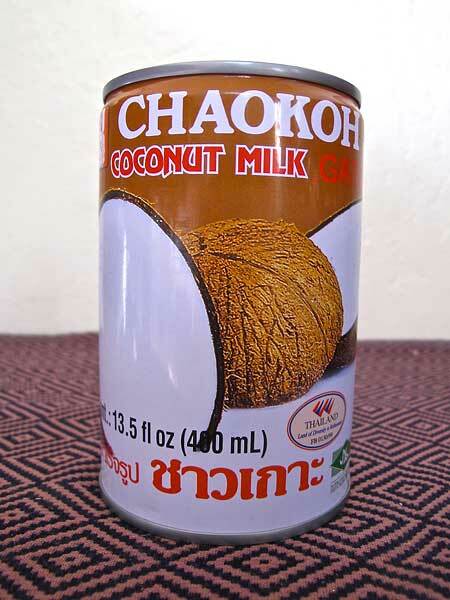 It has fairly good coconut flavor, though when compared side-by-side with Chaokoh, it tastes a little bland and has less of the natural sweetness of fresh coconut milk. 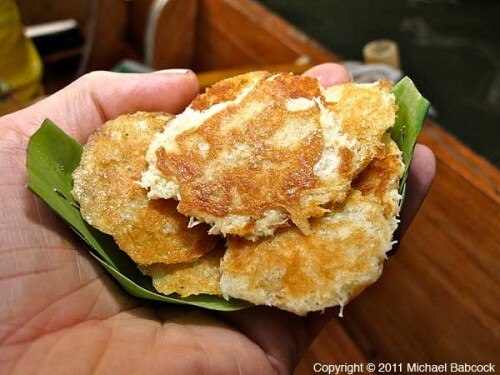 Some of this weakness can be balanced during cooking with the addition of palm sugar. 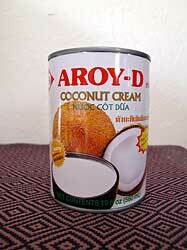 Aroy-D has a new product: a 19 oz.-size can labelled as “Coconut Cream” with only coconut and water as the ingredients. It’s the only product labelled as “Coconut Cream” that I recommend. All the other brands labelled as coconut cream has a strong unnatural flavor from processing or from emulsifiers like guar gum added. 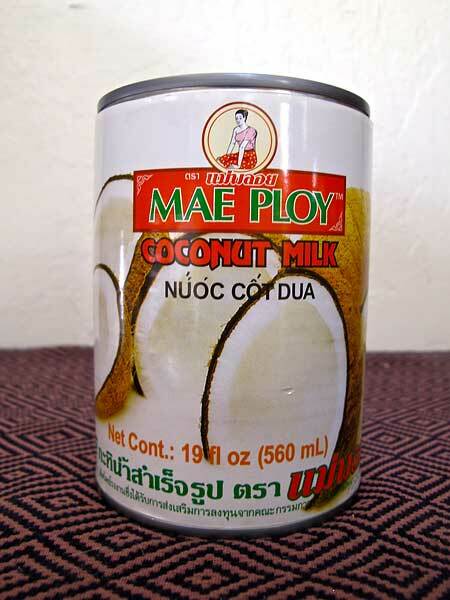 In the past, besides Chaokoh and Mae Ploy, we’ve had pretty good luck with the Natural Value label (available locally at Rainbow Foods in SF and Farmer Joe’s in Oakland) for good, rich coconut milk that does not have any preservative or emulsifying additives. Natural Value is the only brand of organic coconut milk that we recommend because it does not contain guar gum: unfortunately most brands of organic coconut milk contain guar gum as an emulsifier. 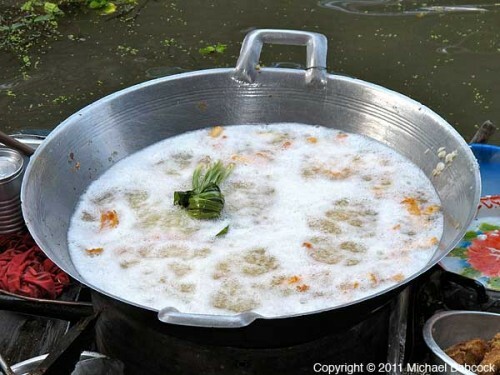 Guar gum ruins the natural flavor of the coconut milk, leaves an unpleasant aftertaste, and does not work well in Thai cooking. 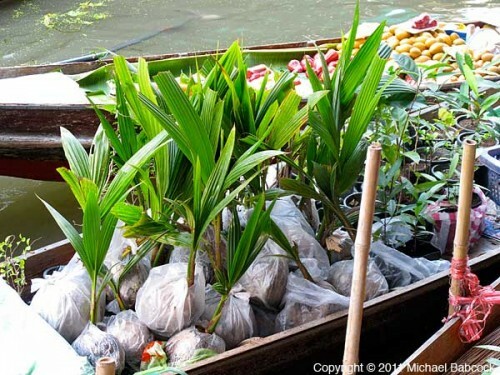 Coconut palms generally grow easily in poor, sandy soil along the coast and do not require much care as far as fertilizing or spraying to control diseases and pests. So most brands of natural-tasting coconut milk are pretty much organic but the plantations may not be “certified organic” for the milk to be labeled as “organic.” There are slightly different processing standards for organic as well. The Natural Value brand that is not labeled “organic” is just as natural as the “organic” one – both only contain coconut extract and water and list no preservatives or emulsifiers. 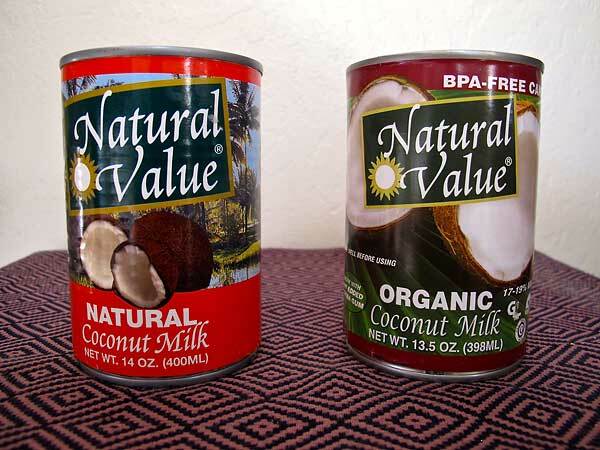 Natural Value wasn’t able to find a manufacturer in Thailand that produces “organic” coconut milk without guar gum added as emulsifier so their organic coconut milk now coms from the Philippines. 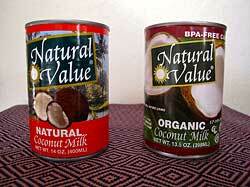 Both of their products have the added advantage of being in BPA-free cans. 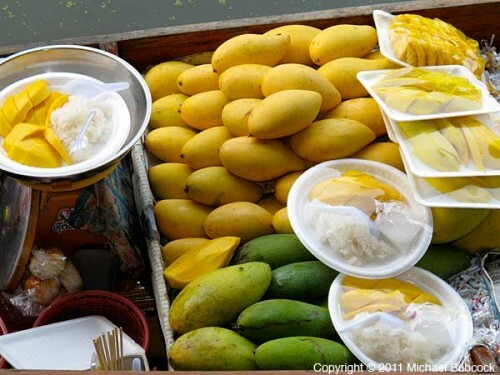 Both the organic and non-organic products are good, though we have found the organic to be not as rich as their non-organic product (from Thailand) that can be thick with cream (but this could have changed with the coconut shortage). Though prices have stabilized and may have begun to drop a little, it is unlikely that we will see the 69 cents we used to pay for a can of Chaokoh coconut milk a few years ago. The coconut shortage is a long-term problem as new groves have to be planted and time given for the new trees to reach maturity. The good news is the industry has been able to use biological means to control the pest problem instead of resorting to chemical pesticides. 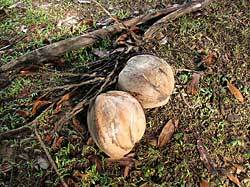 Coconuts: A Fruit, a Nut or a Seed?” – Find out which! 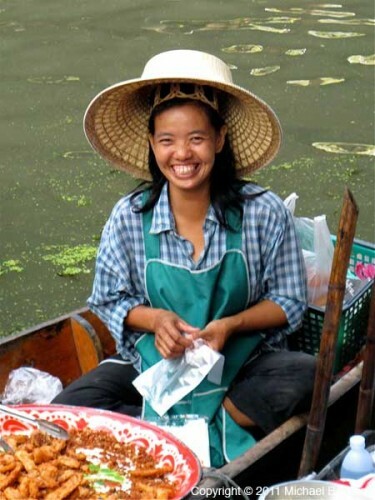 Kasma’s Favorite Brands – The brands Kasma uses in her cooking. Selecting a Coconut for Purchase. 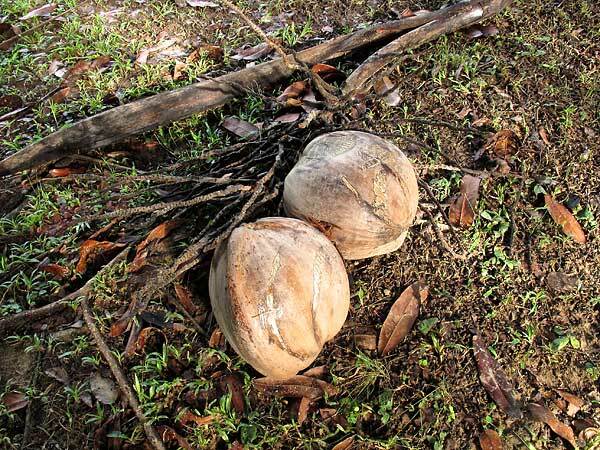 How to Crack a Coconut – the easy way! Includes demonstration video. How to Shred a Coconut. Preparing a Coconut for Pressing Milk. Recipes with Coconut or Coconut Milk. 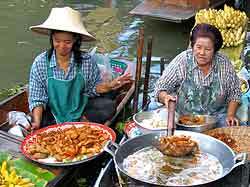 Coconuts in Thailand – Eat a coconut a day in Thailand and stay healthy. The Truth About Coconut oil – Some basic facts about health properties of coconut oil. Also in Adobe Acrobat (PDF) Version. 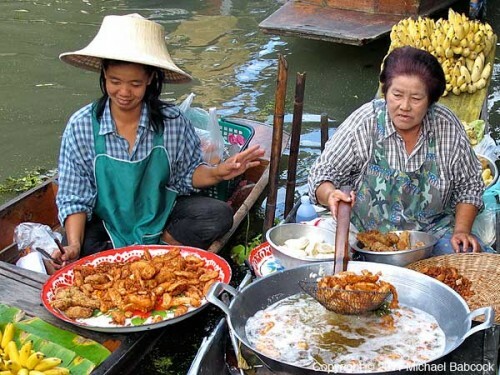 Offsite Coconut Links – Links to offsite articles and website. 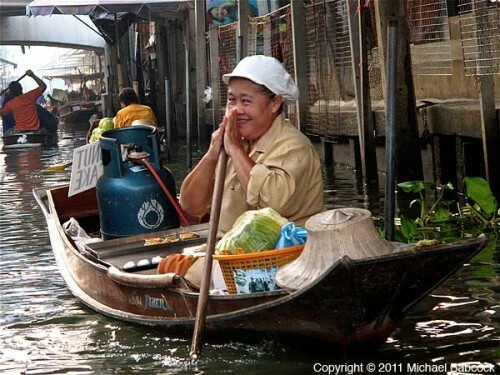 You are currently browsing the Thai Food and Travel Blog blog archives for January, 2013.